I can’t believe I took some of these photos YEARS ago and I’m just now getting this post up. Yikes! 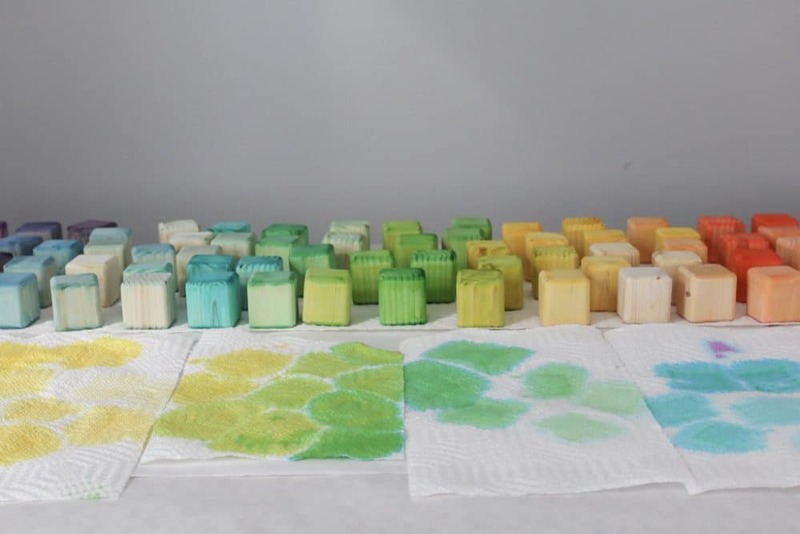 I’ve been wanting to share my methods on how to dye wooden blocks for so long. Finally, I’ve got the info ready for you! For quite a few years now my Dad and brothers have been making wooden toys for my girls birthday and Christmas presents. 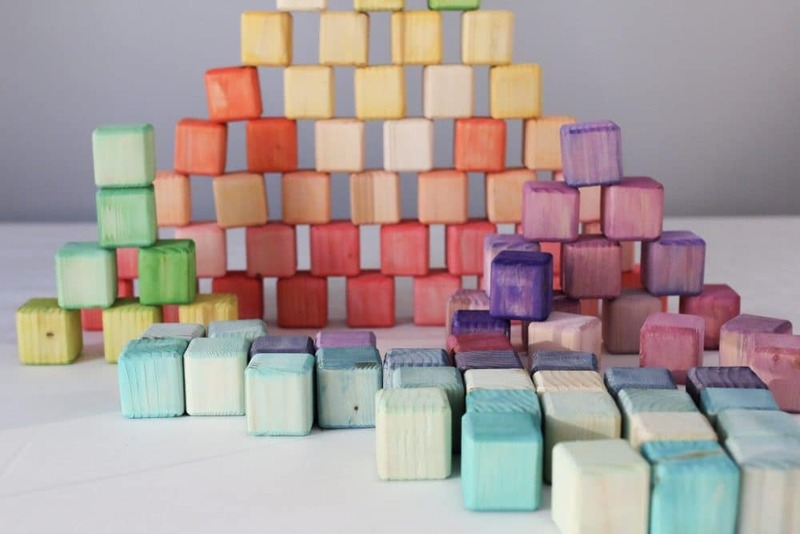 Up until recently they worked the wood tools and I was in charge of figuring out how to dye wooden blocks (trial and error!). Even though my brother is still the best with the tools, I really love using the saws and machines to make these blocks! 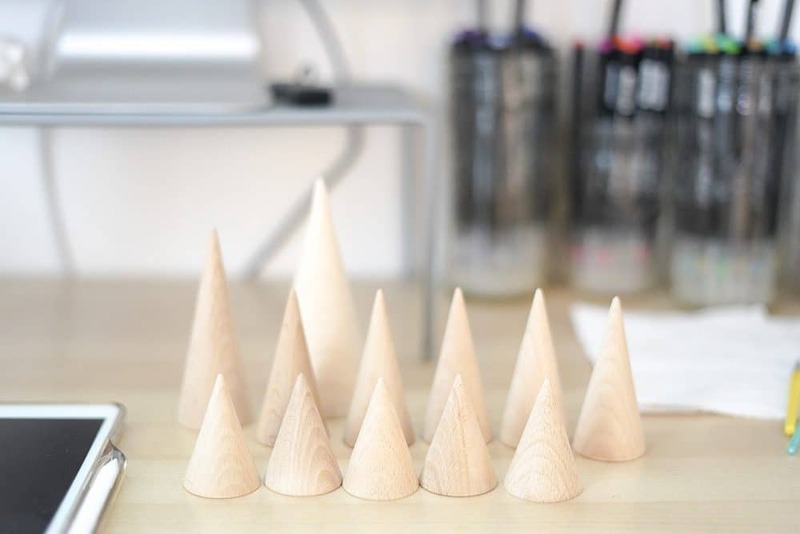 There’s something so satisfying about turning a big blank piece of wood into little toys. 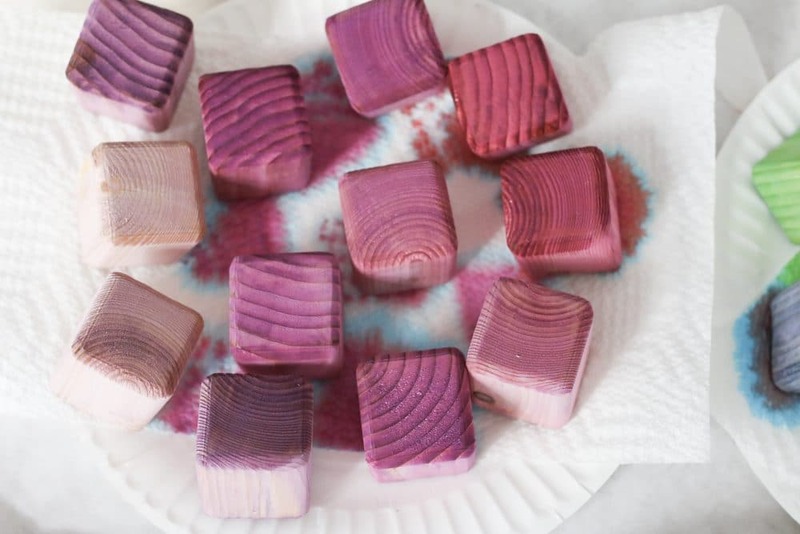 When you are learning how to dye wooden blocks you need to source raw wood shapes. 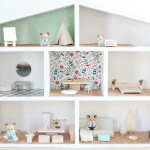 If you aren’t able to access or use power tools to create the toys yourself, my best hack is to turn to etsy! 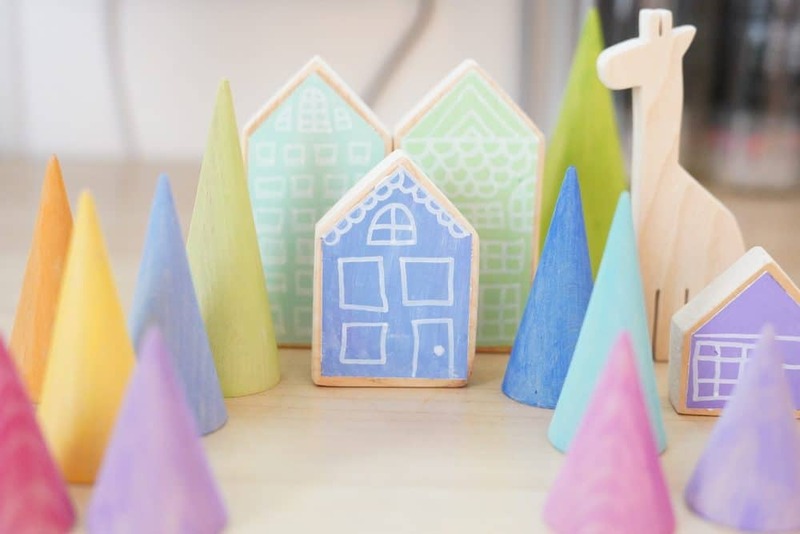 You can find some great shops there that sell the blank wooden toys that you can then finish yourself any way you want. 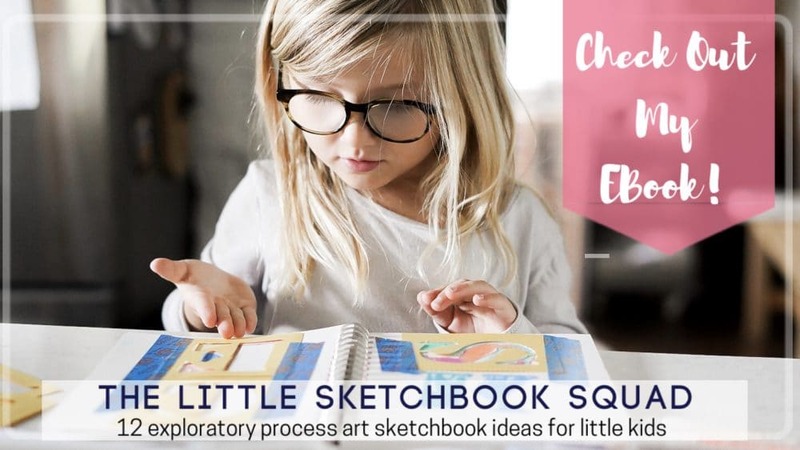 It’s cheaper and leaves the slate blank for you to use your imagination and create a set that is exactly how you want it to be. Just be careful with how long shipping times are around the holidays! 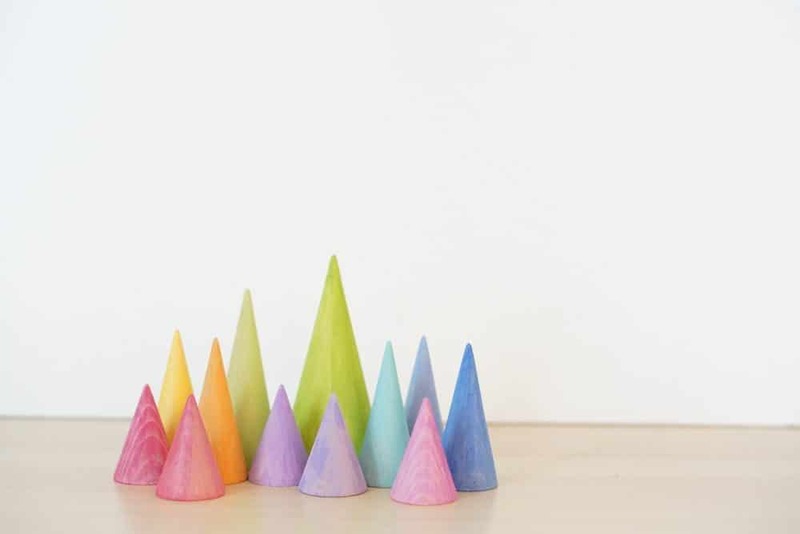 The little cones below came from a shop called Ukrainian Woods on etsy. 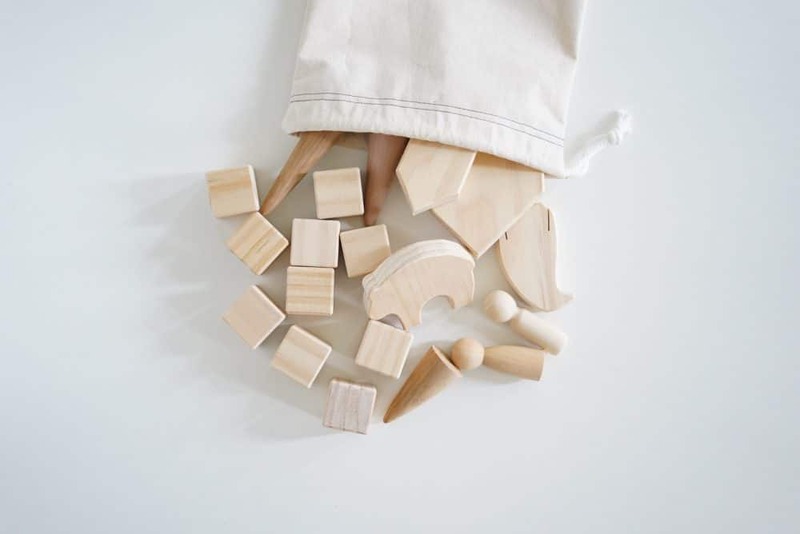 I’ve tried quite a few different things with our wooden toys and I’m really excited to share what I know with all of you! The first thing to know ahead of time (and embrace!) is that all woods take dye, paint, and stain differently. Some woods are softer and more porous. Other woods are harder and repel moisture. I haven’t yet met a wood I didn’t like. But I do expect to just go with the flow and work with whatever that particular wood ends up taking (or not). The small cubes on the left are pine, the center set is maple, and the set on the left is pine as well (at Home Depot you need to ask for “select” pine). 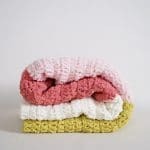 They’re all dyed with McCormick food coloring and water if you can believe it! Crazy right?! 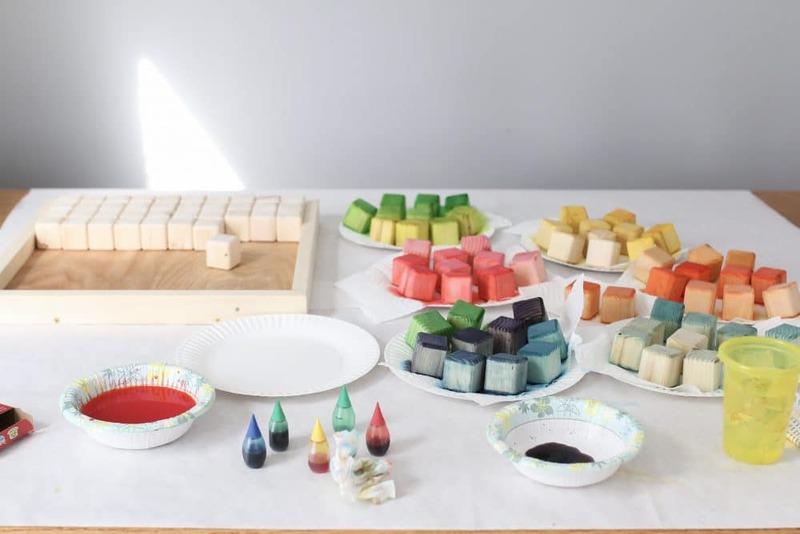 Learning my method for how to dye wooden blocks might seem intimidating but it is really easy. Promise! Start with a primary color (red, blue or yellow) and add it to a dish with a tablespoon of water. 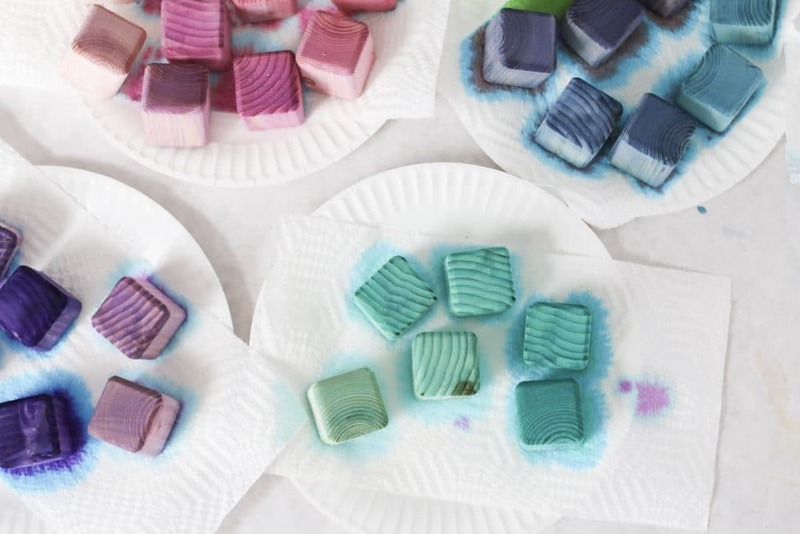 Try 5 drops of dye and 1/4 cup water. 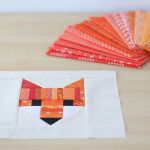 Dye a single block or toy by dipping it into the color. 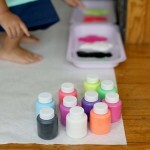 If you want to lighten the color for the next block, add a splash of water. When you want to darken the color add a drop of dye. 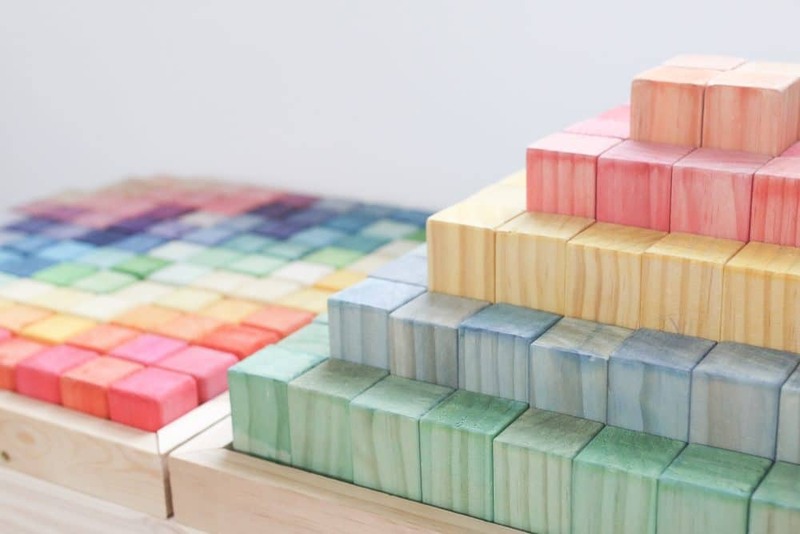 For a subtle rainbow ombre effect, very slowly add in another primary color (like add yellow into red very slowly, block after block, until you reach a bright orange or add yellow into blue until you reach a bright green). 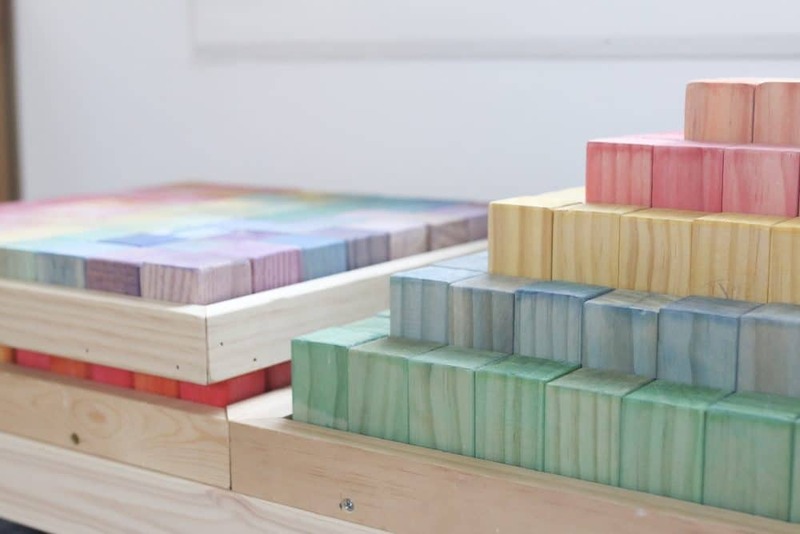 Dyed wooden blocks are so beautiful! Change water frequently or when you need to switch colors. 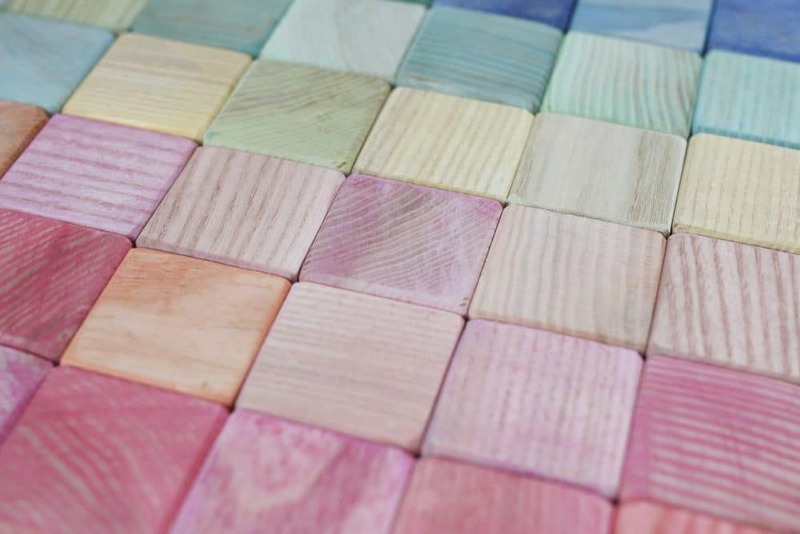 Depending on the wood you use the blocks will soak up the water and dry fairly quickly. 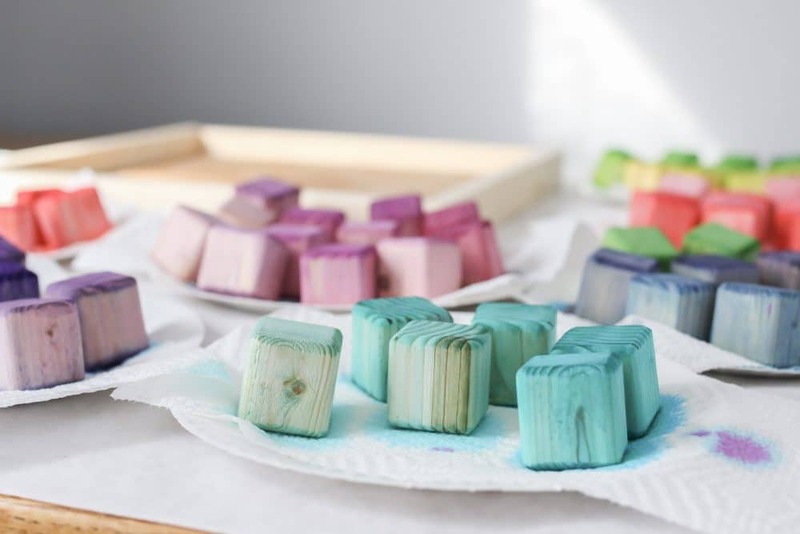 Because the dye is so diluted with water it really soaks into the wood grain and doesn’t transfer if little gums happen to chew on the blocks. 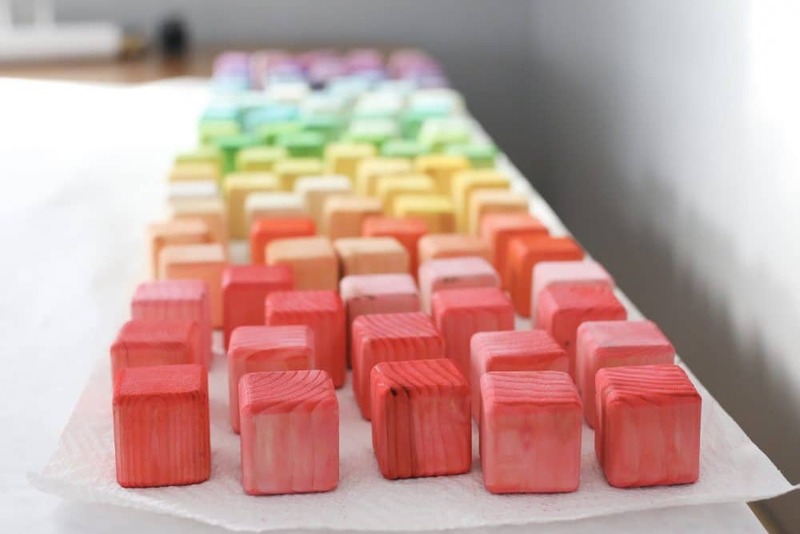 Learning how to dye wooden blocks this way can feel like a slow and painstaking process but it is worth it ten times over to have a set of blocks where every single one is a slightly different shade. Keep changing the colors by going back and forth between what you mixed and another primary. If you accidentally mix up a brown just toss your water and start again. Paper bowls work really well for this process. 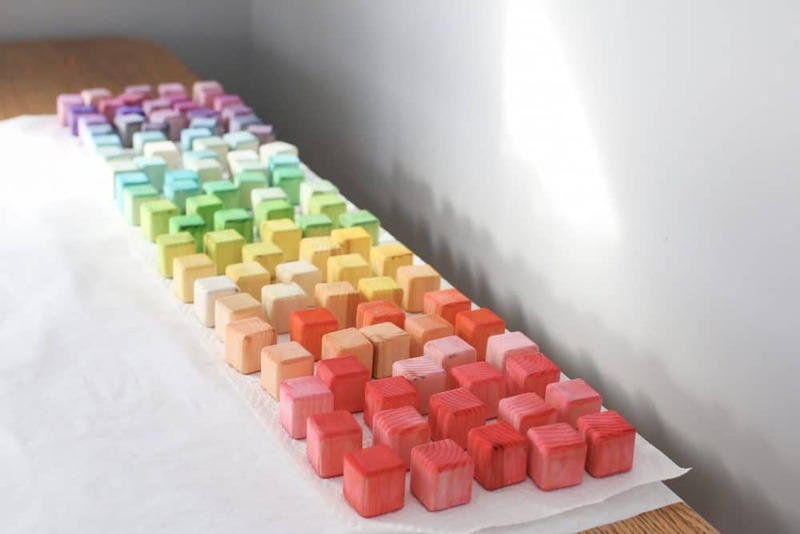 All of the following blocks are dyed with food coloring. 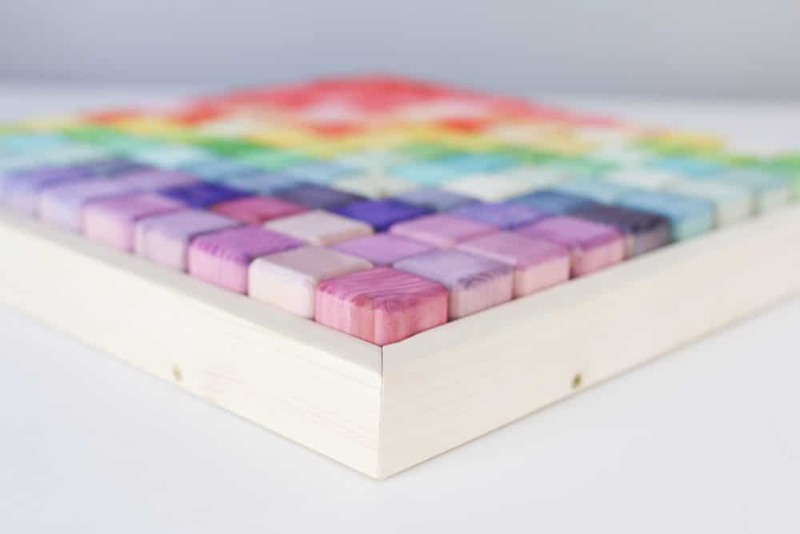 The next method of finishing blocks is to use acrylic. This will give you a more opaque finish and hide some of the natural grain of the wood. 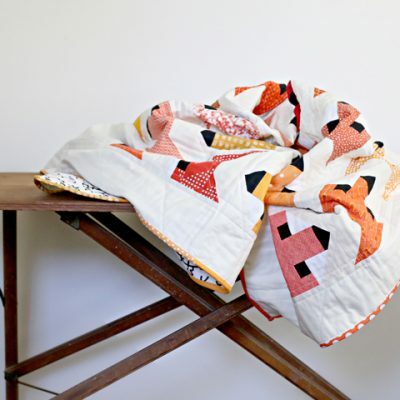 It’s a great choice if you want to hide imperfections in scrap wood for example or just want a more colorful set. 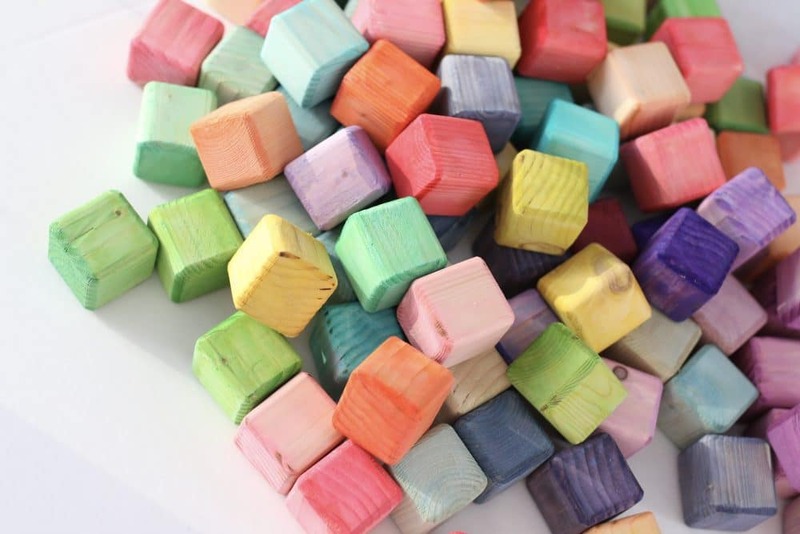 To finish the blocks with acrylic (no matter what color) I add a little bit of white paint and a little bit of water. You still want the wood to “soak up” the finish and not sit completely on top. This will help make sure your blocks are durable and safe. 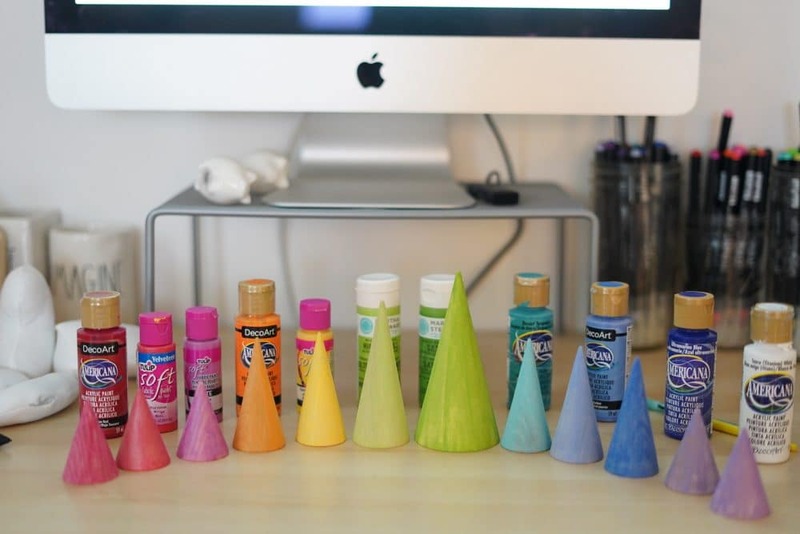 Before anyone points it out – I realize acrylic paint might not be 100 non-toxic. 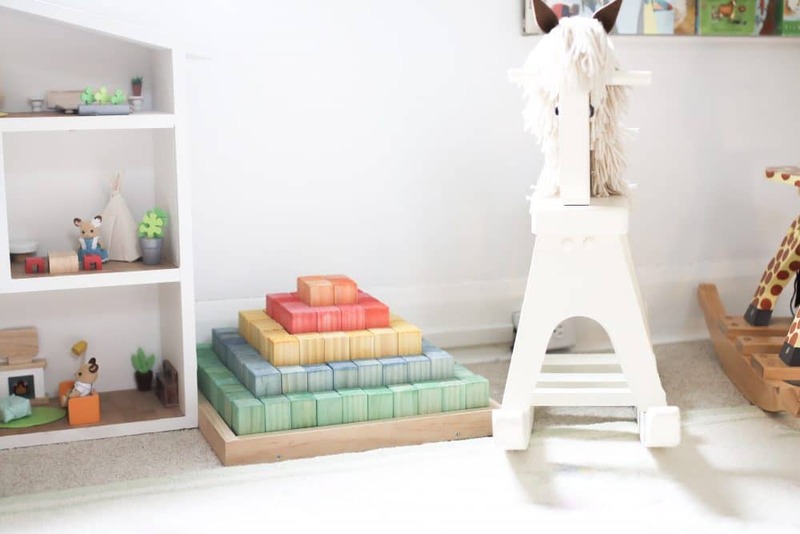 If you are really worried about your little ones chewing on the blocks don’t use acrylic. Use common sense. I used a little bit of a bunch of different kinds of paints based on the colors I wanted. It didn’t make too much of a difference! 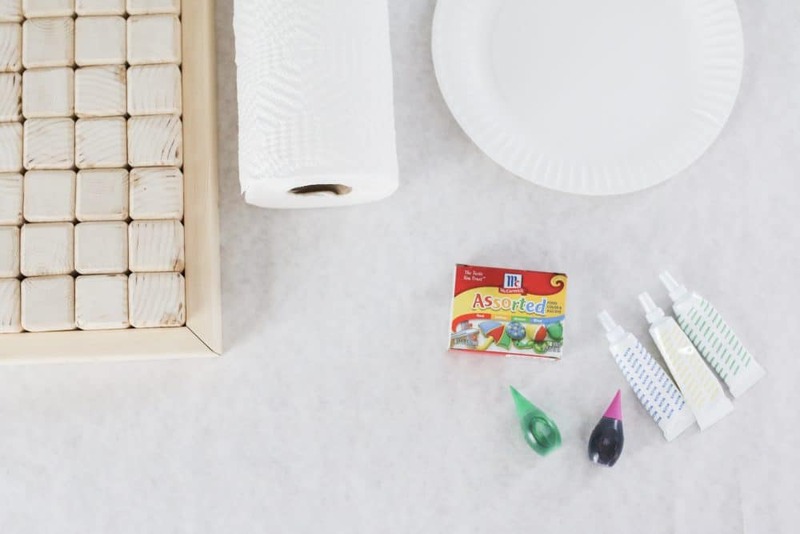 DecoArt, Tulip fabric paint, Martha Stewart. It was all pretty much the same. You can use acrylics with no water too. For our house block set I taped off each block with painters tape. Then I painted a quick coat of white before each color. After they dried I used a white paint pen to add details. Finish with a very thin coat of food-safe matte modge podge if you want. 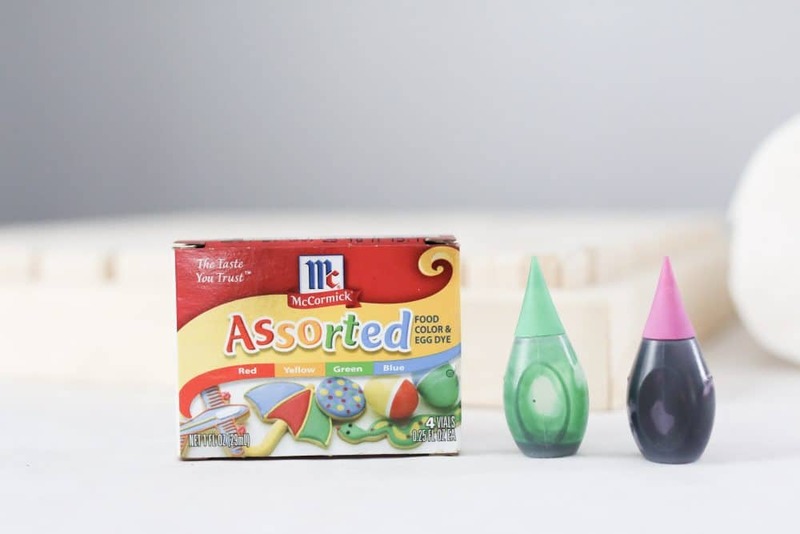 These I would personally recommend either be for big kids or for kid use with supervision. Because the paint isn’t watered down it sits on top of the wood and in theory could be chewed off if a kid worked hard enough at it. Let me know if yoh have any questions and I’ll do my best to answer! These are so beautiful! I love them! 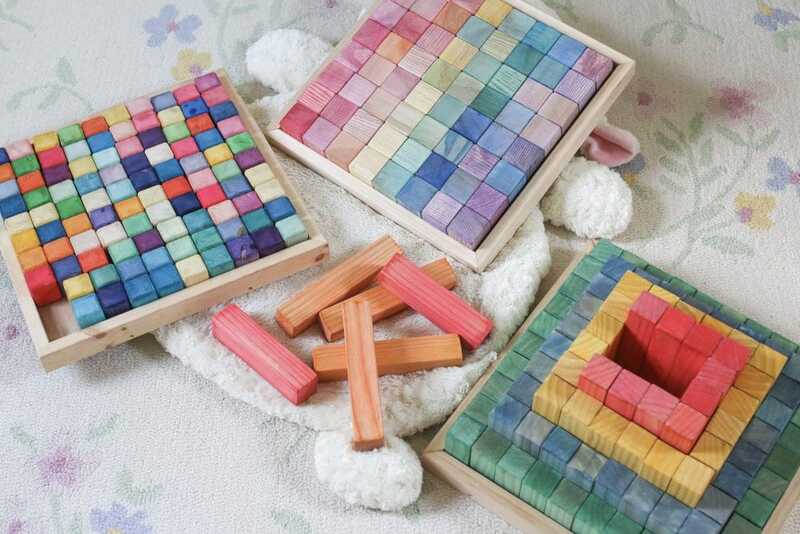 We definitely plan to dye some blocks for our girl when she’s a little bit older and we can give her some smaller blocks. I never knew about this. Thank you so much for sharing! 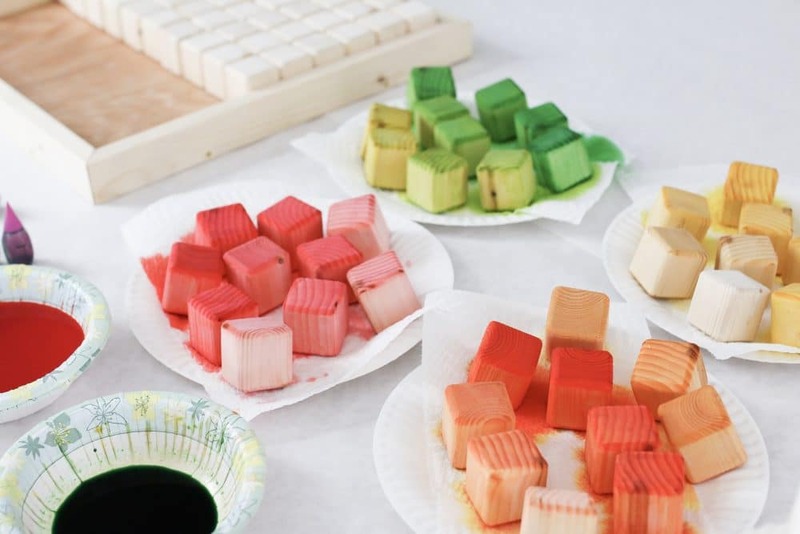 How long do you leave the wood in the food coloring mixture? Up to you! Just a few seconds is plenty. A little bit longer gives them a little bit more color. 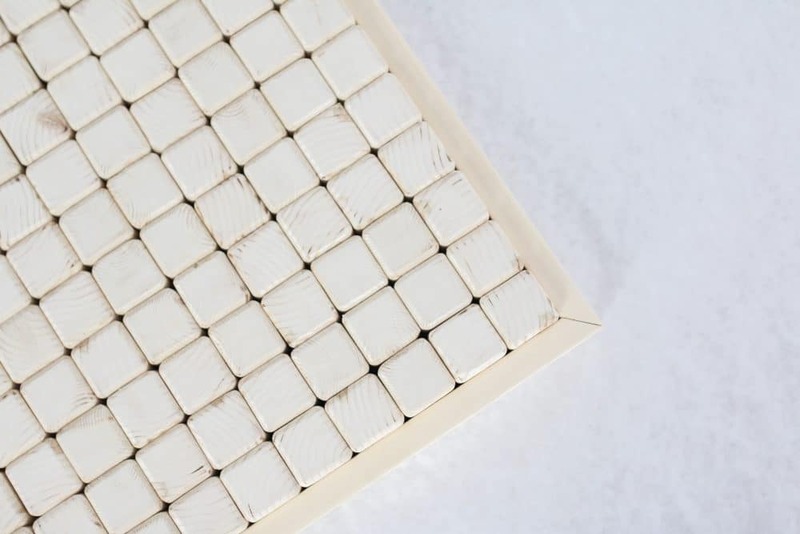 What is your source for the cubes and tray, please? We make both ourselves. You can buy unfinished cubes on Etsy though! Lovely! 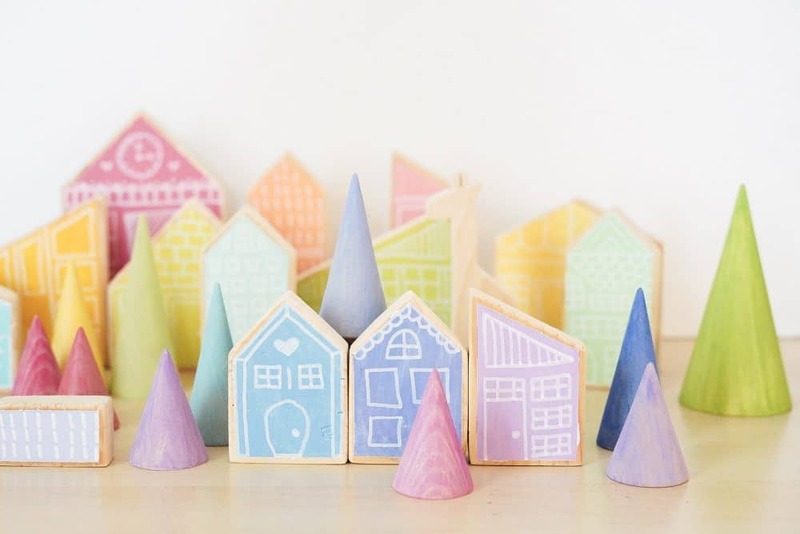 Do you have a source for the blank house blocks, or do you cut and sand them yourself? If you cut, what type of wood and what width and thickness do you think is best? We make them ourselves! It varies but we try to use select pine when we can. We’ve used maple and ash too.